Invacare Overbed Tables are practical, easy-to-use units suitable for both homes and institutions. The height of the tables easily adjusts for comfort while reading, writing or eating. 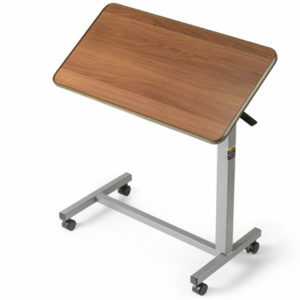 They feature an attractive walnut wood-grained laminate top with a T-molded edge that is designed to resist damage. The heavy-gauge painted, tubular, welded steel construction ensures durability, and the 1.5in casters ensure smooth mobility of the table in any direction. Adaptable tilt-top allows three angle positions in either direction using tilt-release lever. Light upward touch allows table to elevate freely; Downward touch on tabletop locks into position. Attractive walnut wood-grained laminate top with flush-mounted T-molded edge (1/8in raised edge on tilt-top model) designed to resist damage. Supports up to 25 pounds of evenly distributed weight when table is in lowest position.